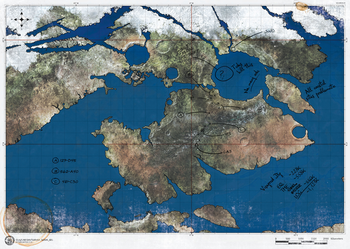 The Viery Territory was a large region on the planet Reach. The territory encompassed the planet's Eposz continent, where many of Reach's major cities and UNSC military installations were located. It was the site of many battles between the UNSC and the Covenant during the Fall of Reach in 2552. Satellite image of UNSC deployments across the Viery Territory. A map showing the Viery Territory. "Viery" is the Slovak word for "faith".